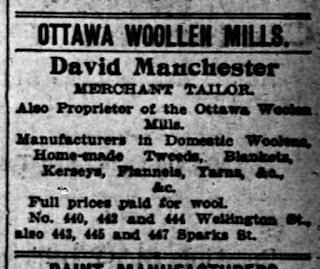 This article today will explore the little-known story of David Manchester, his contributions to Ottawa, and in particular, to Hintonburg. Manchester moved as a young adult to Manitoulin Island, Ontario, becoming one of the first white men to reside there. He acquired a large amount of government land in the district and was engaged in lumbering, employing several ships. There he learned to speak fluent Ojibway. By 1861, Manchester had relocated to the LeBreton Flats area, where he opened a merchant tailor shop (at 62 Queen West, the south-east corner of Cathcart; today that would be located at the corner of Fleet and Lett respectively, exactly where the Claridge Fusion building now stands). He married Mary Ann Tayler, whose father, Richard Taylor was for many years an Irish justice of the peace before their family had moved to Nepean. The couple had three children, William Albert (b. 1863), David Levi (b. 1865), and George Herbert (b. 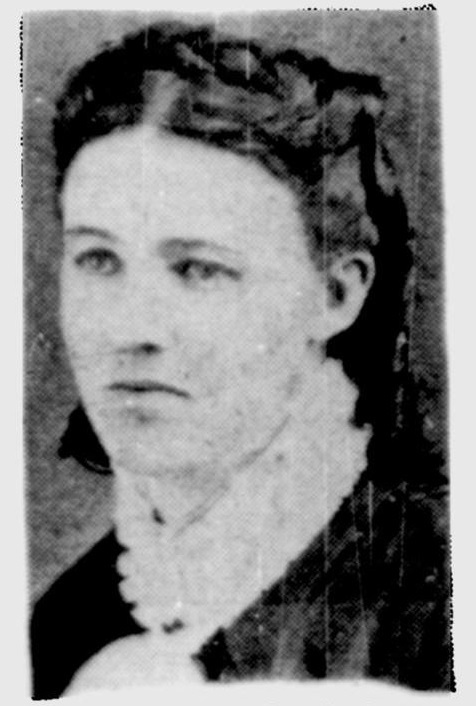 1872) before Mary Ann passed away at the young age of 32 or 33 in 1872 or 1873. 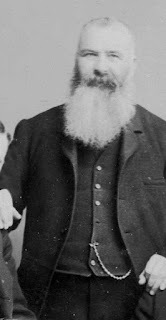 David remarried in 1874 to Helen Caldwell, and the couple would go on to have 9 children between 1876 and 1889, 7 of whom survived infancy: Samuel Jacob, Wilber Maxwell, Clifford, Helen, Mary, William S., and D. Elwood. Mary would pass away in childhood, leaving Helen as the only Manchester daughter. David was also described as a wealthy and progressive man. He was a Methodist, and a strict one. He and his family were members of the Wesleyan Church and later of the Dominion Methodist Church. 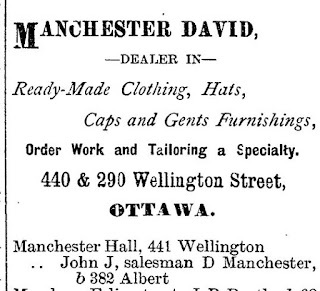 In 1883, David constructed a large building at 440-442-444 Wellington Street, where he ran his successful and prosperous merchant tailoring business out of. The family resided above the business, the residence portion accessed via a rear entrance on Sparks Street (the residence was officially 447 Sparks). In October of 1894, Samuel J. McArthur was hired by Manchester to construct a large extension to the store (40x30 feet, 2 stories tall, adjoining the existing premises). McArthur would later acquire a series of Hintonburg lots from Manchester and build quite a few houses and shops in the neighbourhood. stands is just about exactly where Manchester's shop was. commercial space well into the 1930s. Wellington met (Sparks in foreground, Wellington in back). 440-442 is the building labelled "Coffee". the front of the 440-444 Wellington stores. Between 1888-1889, immediately across the street from his shop, at 443 Wellington Street, Manchester erected a thin, but mammothly tall six-storey brick house for he and his family. The six stories were intentional; he wanted a house that would stand out. The building had two distinct parts - a residence on the south, and a hall for rentals on the north, which he called "Manchester Hall". Manchester's mansion was described later: "Dominating the entire neighborhood was the six-storey mansion of Mr. David Manchester; a brick house that belonged in the sky-scraper class at the time. Six stories were remarkable enough for an office building, but for a residence!... The home was set in spacious grounds sloping down towards the stables. Both house and stables were built of brick as were sheds for tools of various kinds." The stables were later converted in to a duplex which existed off of Wellington for many years. The bedrooms in his mansion were on the ground floor. A hired man looked after the furnace and the lamps until the advent of gas. The fire insurance plans of the eras confirm the six-storey height of the house. 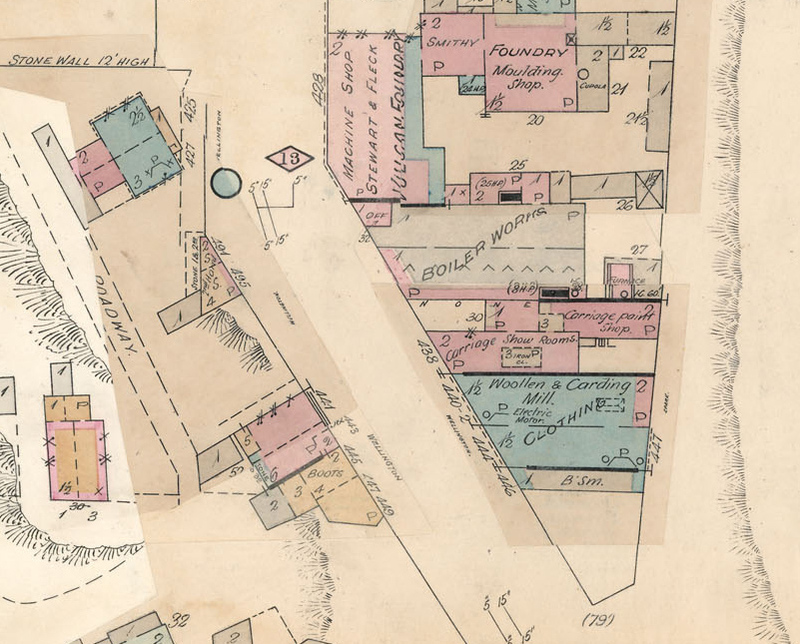 Below is a great view of the area from the 1888 fire insurance plan, which depicts the house and business. the pink house across the street is his house. A surviving photo of the house from 1938 below shows the building as it was then. Clearly it is not 6 storeys tall, and through my research, I am unable to tell why/how this had changed. Obviously it must have been altered/reduced at some point in time. former Manchester home and Manchester Hall. For a period in the 1890s, David's son David Levi Manchester was in the tailoring business as well. 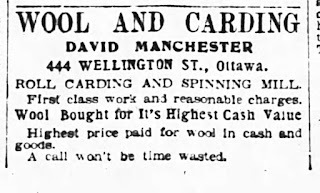 They co-operated the shop for a while, before David Jr. opened a store of his own at 290 Wellington. On the 1891 Census, Manchester and his family were listed, but some of the additional details explain how successful business was for Manchester at the time. He was listed as the employer of 60 people at the time, and his family had a live-in children's nurse (a 17-year old girl) and a "family cook", who was 25. The Censuses of 1901 and 1911 also listed the family as having live-in servants. to retire, or perhaps more likely as a sales gimmick. 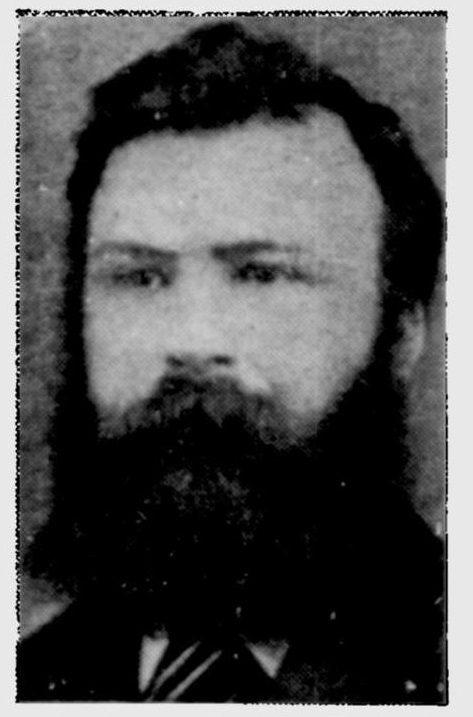 sale" From the Ottawa Journal, October 11, 1893. Manchester was also notably very charitable, with the newspapers recounting regularly a donation or contribution he had made to an organization or cause. 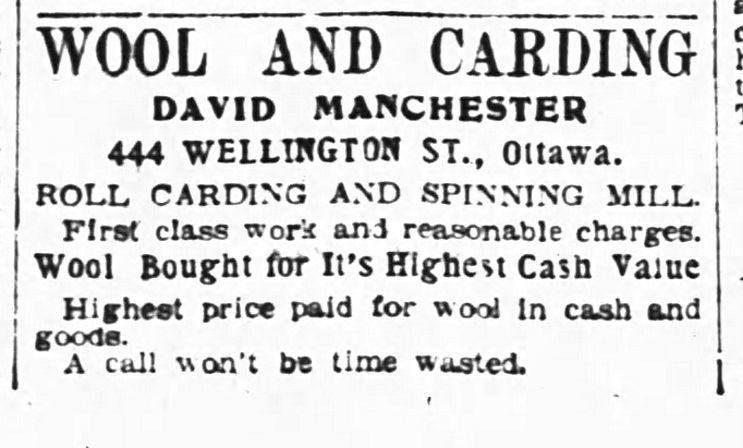 For some quick examples, at Christmas 1899, he donated 6 boys' cardigan jackets to the St. Patrick's Asylum, and in May of 1900, following the great fire of Ottawa-Hull, he donated clothing to the victims totaling in value $305. 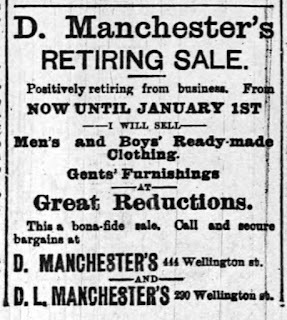 Around 1905, Manchester retired from business. He remained active however in real estate, and put more focus on this area. In his retirement, the family took annual trips to Old Orchard, Maine in the summertime. David Manchester later in life (circa 1900). 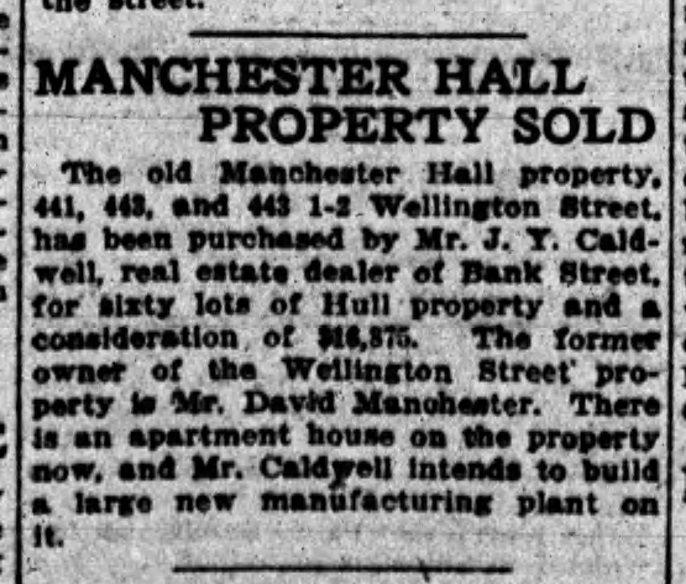 As mentioned in Chris Ryan's post, Manchester Hall was sold in 1911, and Manchester began to sell off the pieces of his Wellington Street home and business. He moved to a house on Bronson Avenue. On June 12, 1911, David Manchester's daughter Helen, his only surviving daughter, married James MacKenzie Skead, son of Senator Hon. James Skead, who also has a lot of history to the Kitchissippi area of course. In June of 1914, David's second wife Helen Manchester passed away at age 66. In April of 1919, the 78-year-old Manchester married for a third time, marrying Annie Hogan, who I believe had been his housekeeper. She was 13 years his junior. 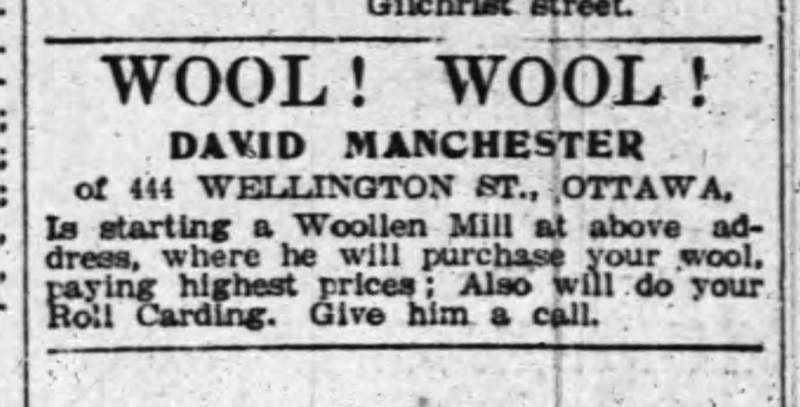 David Manchester passed away on August 17th, 1925 in Ottawa, just shy of his 85th birthday, at his home on Bronson Avenue. His funeral was held in the home of his son Elwood at 101 Stanley Avenue, where he had been living the final months of his life. A large funeral was held with many top names in Ottawa politics and society, and his many friends and business associates. He was buried at St. James cemetery on the Aylmer road on the Quebec side. By 1941, Manchester's estate continued to own assets. Between 1941-42, the federal government paid out over $1.1M for various properties in order to prepare for the realization of the plan to beautify Ottawa, aka the Greber Plan. Part of that bulk acquisition was land the Manchester estate (led by son Samuel J. Manchester) still owned on the north side of Wellington. 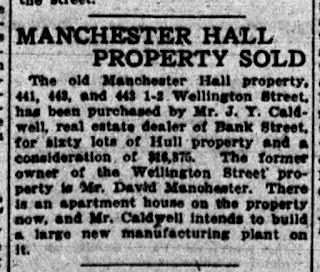 Manchester's holdings in the Hintonburg area, in one word, were vast. It is difficult to come up with a complete list. Real estate ownership records are scattered, and from that era are very few organized listings of full property ownership of an individual. 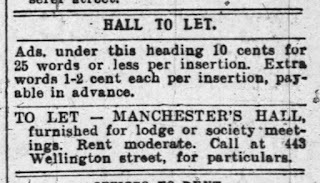 I can only attest to Manchester's Hintonburg acquisitions as his name comes up just about every time I have researched a house, street or business. He clearly was infatuated with real estate prospecting in Hintonburg, and bought and sold land in the area for over a 40 year period. Below are a few highlights of the purchases I know about. There are likely several more I haven't come across yet, or neglected include. 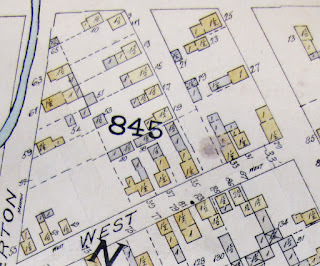 On October 9th, 1883, Manchester acquired a total of 25 lots from Plan 57: all of the lots on the north and south sides of Ladouceur (then known as Centre Street), and all of the lots on the south side of Lowrey (then known as West Street) from Mary Ann Armstrong, widow of Judge Chris Armstrong (he had died in September 1874). Manchester paid $1,250 for the land ($50 per lot). Armstrong had laid out Plan 57 just before he died in 1874, and the land sat essentially unsold for nearly 10 years until Manchester acquired it. 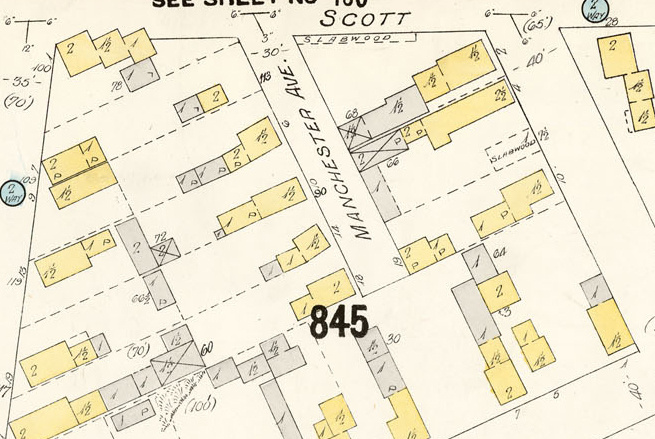 On May 14th, 1884, Manchester acquired an additional large block of land from the Armstrong estate, the north side of Lowrey (West Street) and the lots on the south side of Scott Street, giving him half of the lots on Plan 57. He soon after even re-subdivided these lots to create slightly smaller builder lots, ideal for the potential working class buyers and house builders (particularly railroaders). There were no developers in this era; men would purchase a lot and build for their family a small house, adding to it as they could afford to. Manchester was keenly aware of this, and would take a lot of risks to help these men; Manchester allowed individuals to purchase lots, loan them money to build homes on them, delaying the need for repayment for lot and loans for several years. The purchases were often not even registered at the land registry office for years, likely a part of the deal Manchester made with the men (i.e. you'll get ownership once you've paid X% back of what I've loaned you). 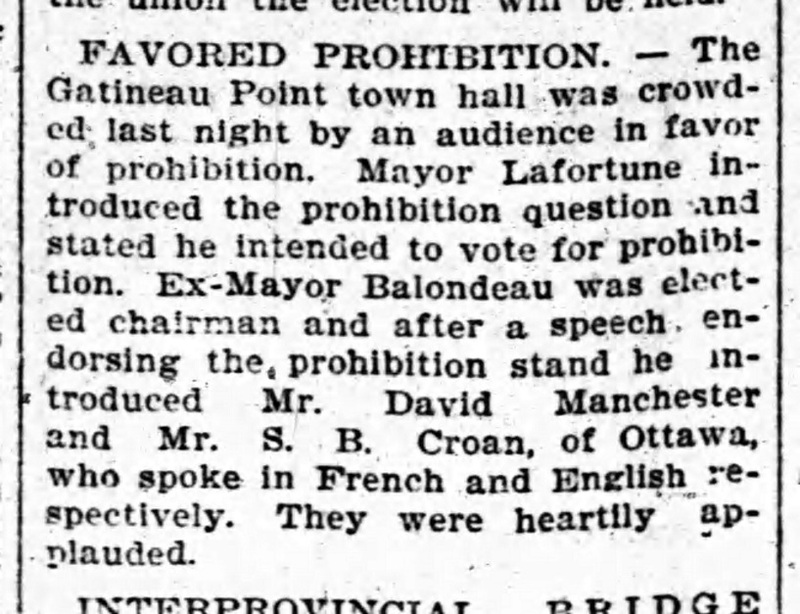 Ottawa Citizen, Feb 28 1931. 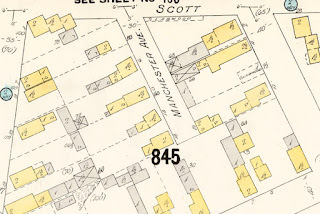 As part of Manchester's re-subdividing in 1887, which was Plan 97, he created a new small street (Manchester Street) running off of Scott Street. 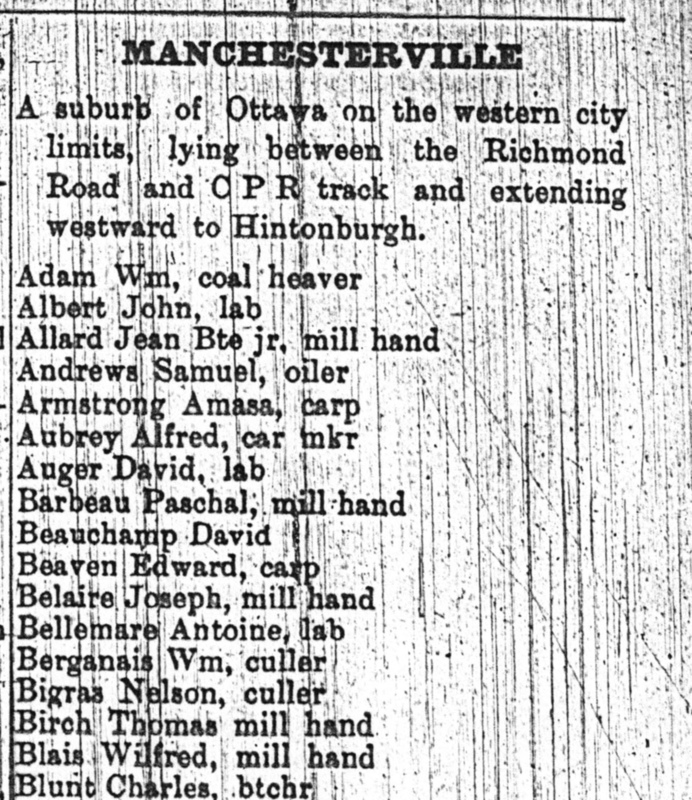 He also named his little subdivision (Ladouceur, Lowrey and Manchester) as "Manchesterville", the name beginning to appear in various directories, news articles and on some documents. The name did not stick and eventually, Manchesterville simply became part of Hintonburg. 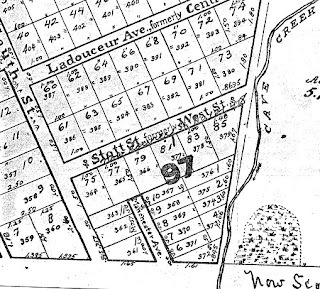 In June 1887, Manchester acquired the entire west half of Sherbrooke Avenue, and laid out a new plan, Plan 95. 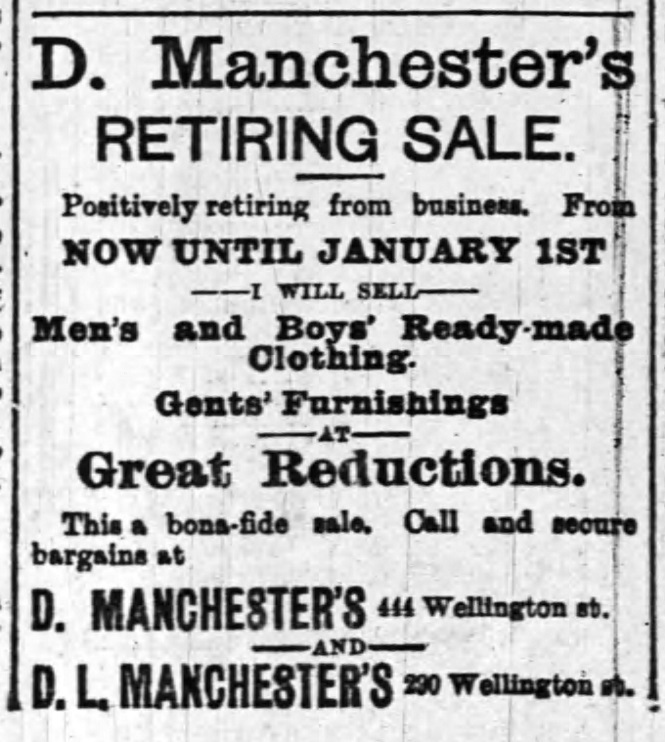 Manchester was quick to begin selling lots, which led to a construction explosion on Sherbrooke (then still called Division) during the winter of 1887-88. The first houses on the west side of the street were all constructed during that winter, a total of 12 all being built at the same time. 8 of these houses still stand today. Development on West Street (Lowrey Street) began in the mid-1880s after Manchester purchased the lots. Between 1884 and 1886, there were six houses completed on Lowrey (five on the south side, and one on the north side), several of which still exist today. 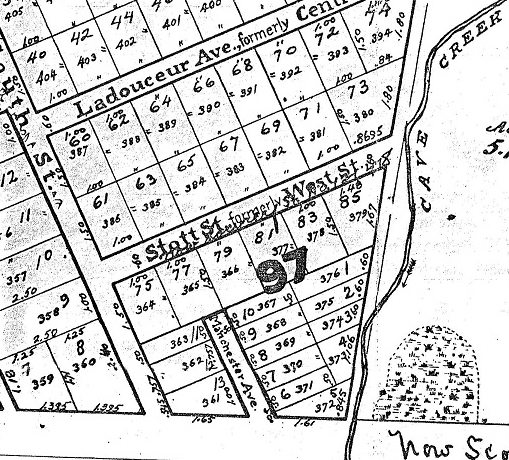 By the late 1880s, Manchester was listed as owning several lots on the west half of Stirling Avenue as well. More on Manchester Street itself, below is a fire insurance plan map of part of Hintonburg from 1895. It shows all houses at the time (yellow is wood frame, grey is outhouses/sheds, etc. brick would be pink, but there is no brick in this area yet). Scott along the top, Merton is at left (along with the old Cave Creek in blue), Lowrey (as West) and Garland is at right. 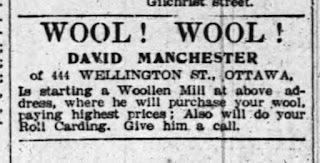 It appears Manchester did not own much Hintonburg land in the mid to late 1890s, perhaps as he was focusing and expanding his tailor/woollen mill business. 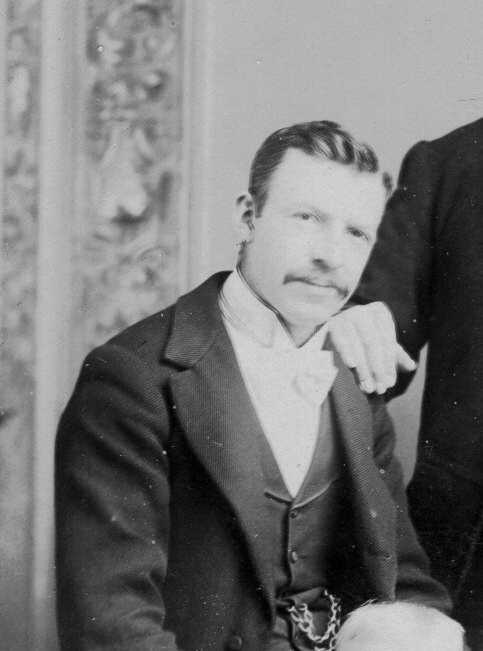 On the eve of the new century, December 26, 1899, he acquired a few lots on Carruthers near Wellington, and then in April of 1901, acquired the whole north end of Carruthers (the Hintonburg portion of the street), from Ladouceur to Scott. He acquired these 10 lots for $1,000. 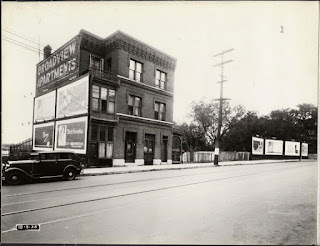 Owning about half of the Hintonburg Carruthers section, Manchester would gradually sell the lots one by one, and helped lot-buyers build their homes by providing extensive credit with easy terms. 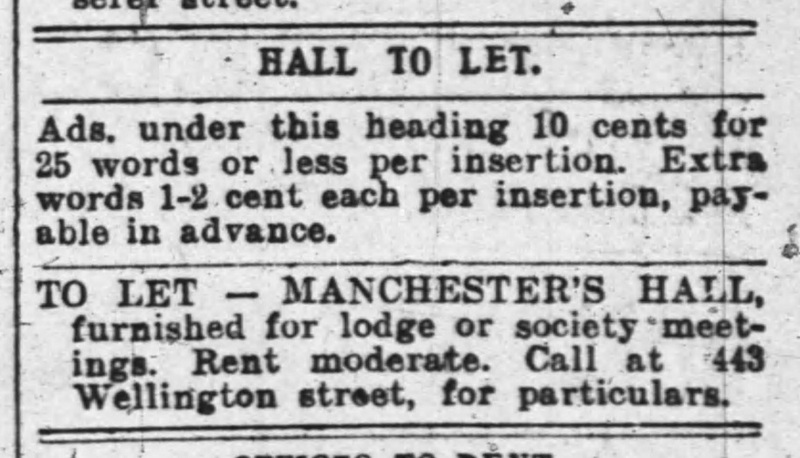 In June of 1903, Manchester acquired lots on Pinhey Street plus 4 acres of property at the north end of Pinhey (the un-subdivided area from plan 155) for $1,900 from the Charles Hamnett Pinhey estate. 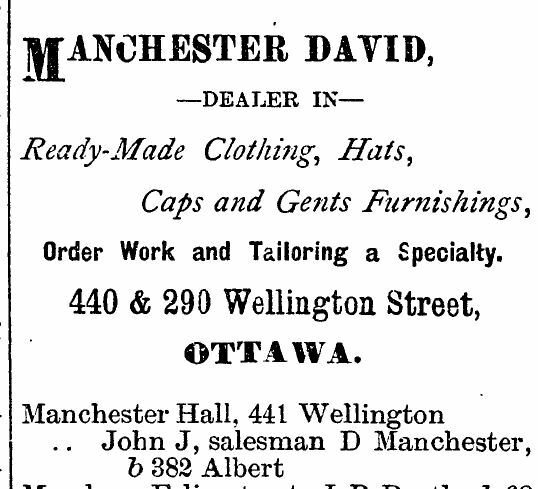 Manchester even opened a branch clothing store in Hintonburg. In August of 1903, Manchester opened a shop in the "Jones block" on the south side of Wellington, just a little east of Irving. A year later, in September 1904, Manchester moved the store across the street, just a little west of Garland (next to Garland's Drug Store). 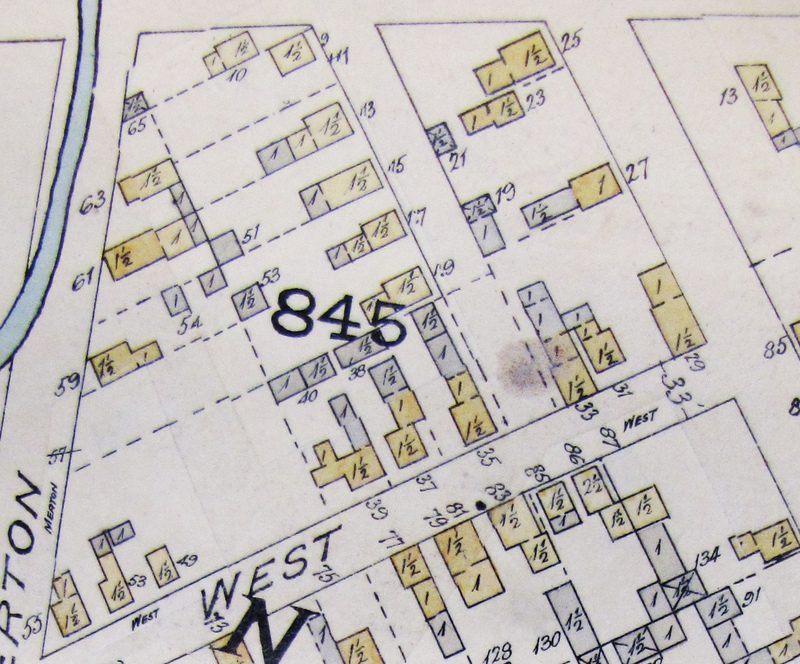 In June 1904, Manchester filed subdivision plan 226, subdividing the 4-acre parcel at the north end of Pinhey and Merton Street. 33 building lots in total, 11 on each side of Pinhey, and 11 on the west side of Merton. The lots ran from Scott to approximately where Ladouceur now runs. In September of 1905, Manchester addressed Hintonburg council regarding the need for the Waterworks Committee to add water service down Pinhey Street. He circulated a petition and provided it to council, who agreed to install a 4" water service on Pinhey "as far as the pipe on hand would allow." After his passing, the Manchester estate continued to hold two final lots on Pinhey until 1942, when they were surrendered to the City of Ottawa due to unpaid taxes. 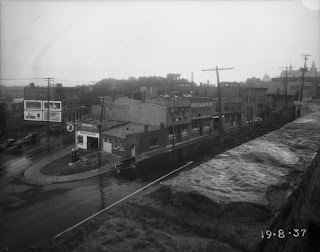 With the real estate marked dead due to the depression and WWII, it was not uncommon that small lot owners were turning over their lots to the City, rather than attempt to make costly tax installment payments. 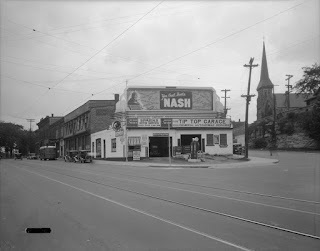 North half of 16 and south half of 17 from plan 226 were transferred on April 23rd, 1942, ending Manchester land ownership in Hintonburg after 60 years. 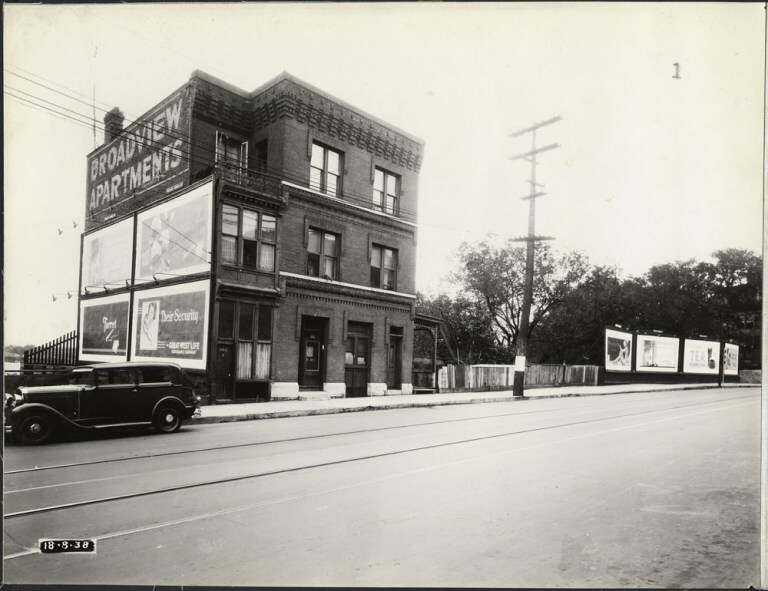 The lots were sold two years later, and 21 and 25 Pinhey Street were soon after built. Manchester Avenue residents have been informed that their name will have to change, the name being I suppose too similar to a longer Manchester Street which runs off of Stittsville Main Street. Residents will be asked for ideas on what name they would like to change to. 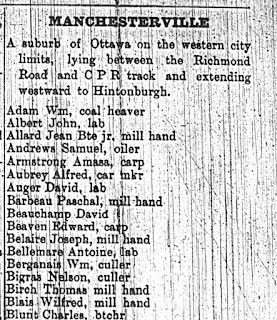 Interestingly, David Manchester Street is not even a possibility, as there is already a street in Ottawa with that name, running parallel to the 417 out in Kanata, from Hazeldean to McGee Side Road. That street is named for another David Manchester, unrelated, who lived during the same era, in the Huntley area. My personal vote (not that I have one) would be to rename Manchester Avenue to Manchesterville (Avenue or Street), as a nod to local history, and to David Manchester, who evidently wished for a subdivision in his name, but was never successful. David Manchester was a significant land owner in Hintonburg, but more than that, he was caring and generous, giving the hardworking labourers an opportunity they likely would never have obtained elsewhere, an opportunity to own their own land, and build their own house. He was indeed running under the radar, giving land and money for the house out of his own pocket, not registering it at the Land Registry, all on the promise that he would be paid back for it. 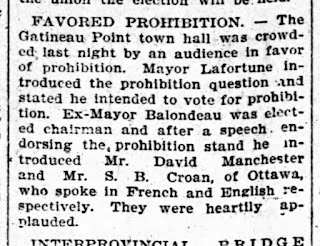 It would be a shame that the last vestige of the Manchester name in Hintonburg threatens to be lost, over a bureaucratic requirement nearly 100 years after his passing. Thank you for bringing the history of my humble street to life! If it wasn't for his vision of a working class neighbourhood with affordable housing, I wouldn't be able to live here today. David Manchester's example is still relevant, 130 years later. What a phenomenal article you have written on David Manchester who was my Great Grandfather. My father William Broadbent Manchester used to tell me stories about his trips as a child with his father William Smiley Manchester (son of David born April19, 1886) collecting rental payments at various properties he held in the Aylmer and Mechanicsville areas, as well as maintaining the gravesite at St. James cemetery in Aylmer. Your research is spot on and so many things of course I did not know, such as his properties, his generosity, his compassion his desire to build upon Hintonburg. It would be wonderful to think is legacy could be remembered in some way.